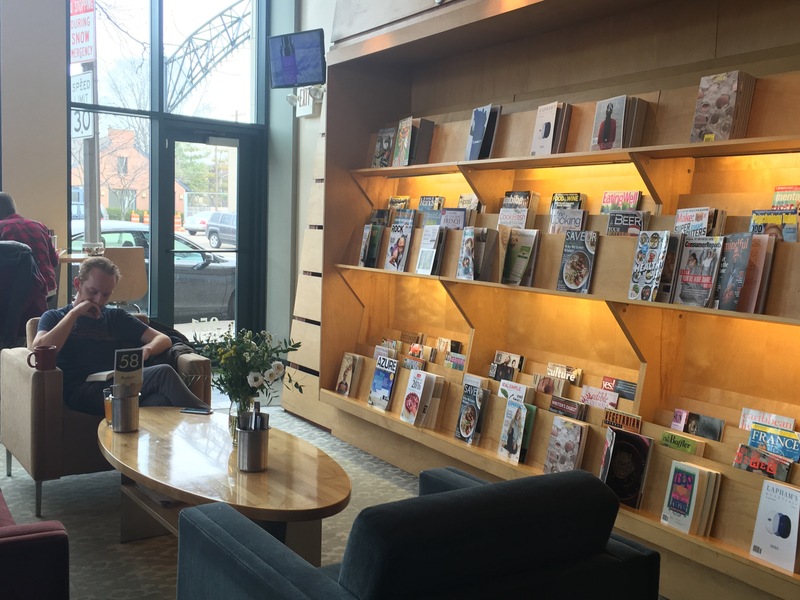 Northstar Cafe in Columbus (Coming to Cincinnati Soon) – Go There. Try That. Because I’m such an evangelist, always sharing what I love, it makes me happy when others tell me about their favorite places to eat or visit. This is part of why I write about my experiences. Either I know about a place someone loves and can share in their enthusiasm, or I add it to my list of places to try. This is how I learned about Northstar Cafe in Columbus. My physical therapist, knowing I spend time in Columbus visiting family, recommended Northstar Cafe as one of her favorite restaurants. I love having an arsenal of places to visit when I’m traveling. Discovering a city through its food and coffee shops- the perfect way to travel! 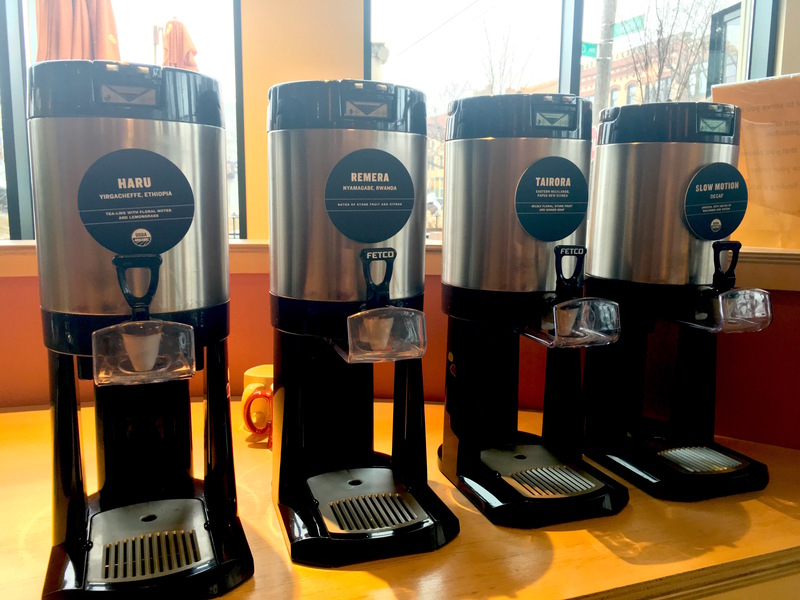 Northstar now has multiple locations in Columbus- our visit took us to The Short North location; if you haven’t spent time in The Short North, it’s a must. To me, it’s reminiscent of the heart of OTR in Cincinnati. 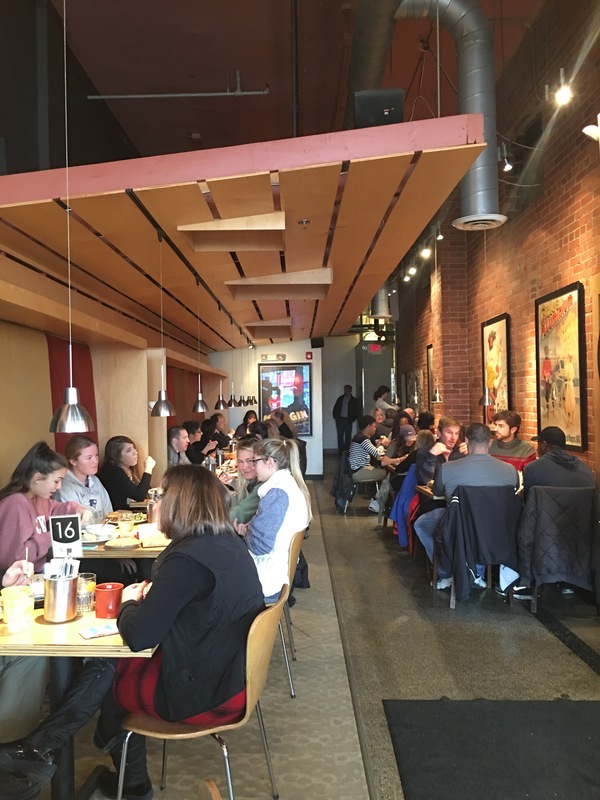 We arrived at Northstar Cafe as the breakfast crowd was weening and the lunch crowd was expanding. I was a little concerned because the line was out the door. However, we perused a menu and before we knew it, we were ordering and had a seat. Northstar is bright and bustling. 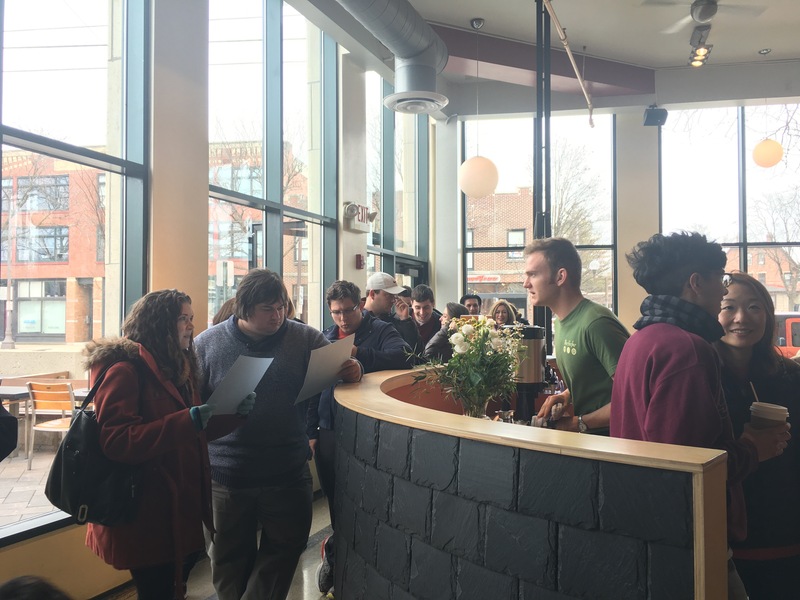 The menu focuses on fresh breakfast, brunch, and baked goods. The drink menu is extensive- from tea to coffee, beer to wine, smoothies to cocktails. I was drooling over the Mint Iced Coffee! The line moves pretty quickly. Order at the counter; food is delivered to the table. 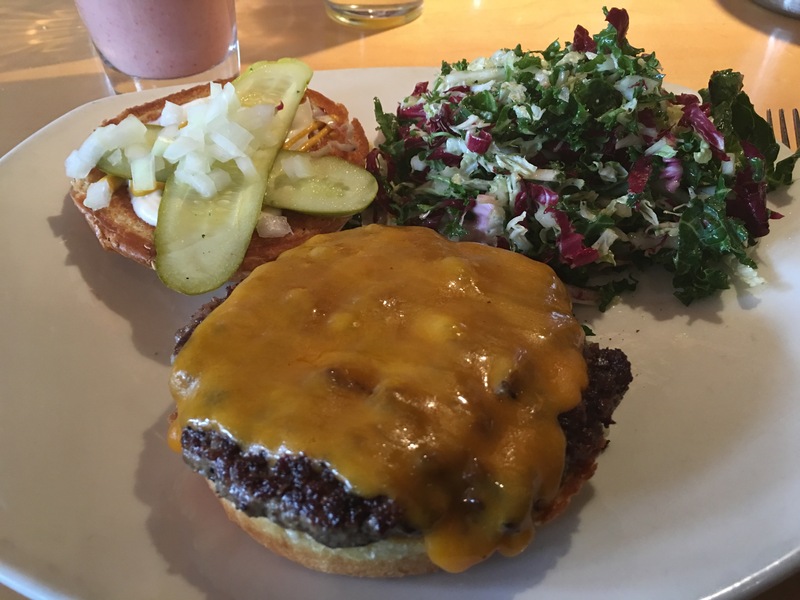 I went to Northstar Cafe specifically for their burger! This farm-to-table, mostly organic restaurant features a Classic Cheeseburger made of brisket and ground chuck (ground in-house daily). This burger is topped with cheddar cheese, onion, tomato, pickle, and lettuce. 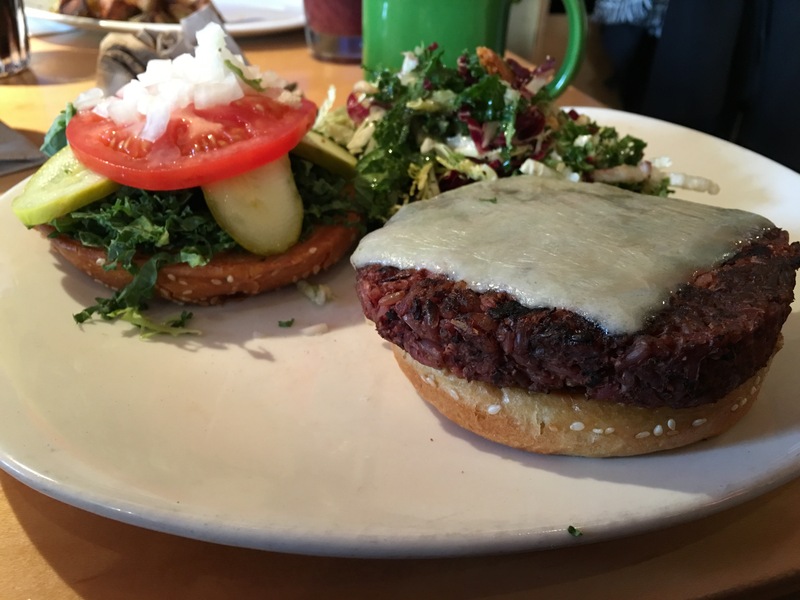 My husband ordered The Northstar Burger, recommended by my therapist, which is a veggie burger made of organic black beans, rice, and beets topped with white cheddar, kale, tomato, onion, and pickle. Both are served with a simple salad comprised of fresh chopped greens and cabbage, tossed in a light vinaigrette. This light side is a great addition to the rich burger. My brother got his burger with a side of Rosemary Roasted Yukon Potatoes– perfectly seasoned and the skins were crispy. The burgers? Delicious. I never order veggie burgers, but had to taste this one. I found it surprisingly good and tender- like a beef burger. My husband said this was the best veggie burger he’s had! High praise! The bun, soft and made in-house, is the perfect compliment to both burgers. I’ve never seen a restaurant with a section of lounge-esque seating surrounded by shelves of magazines to read. Fun touch. It’s restaurant meets bookstore. People were sipping smoothies, coffee, and mimosas while flipping through magazines or chatting with a friend. Coffee from Counter Culture Coffee (direct sourcing). Complimentary meal. Great customer service! I don’t have a picture, but if you go for breakfast, my sister had eggs with biscuits and blackberry jam; this could easily become my jam. These biscuits are special . . . made in-house, fresh, fluffy, slightly sweet, and warm. 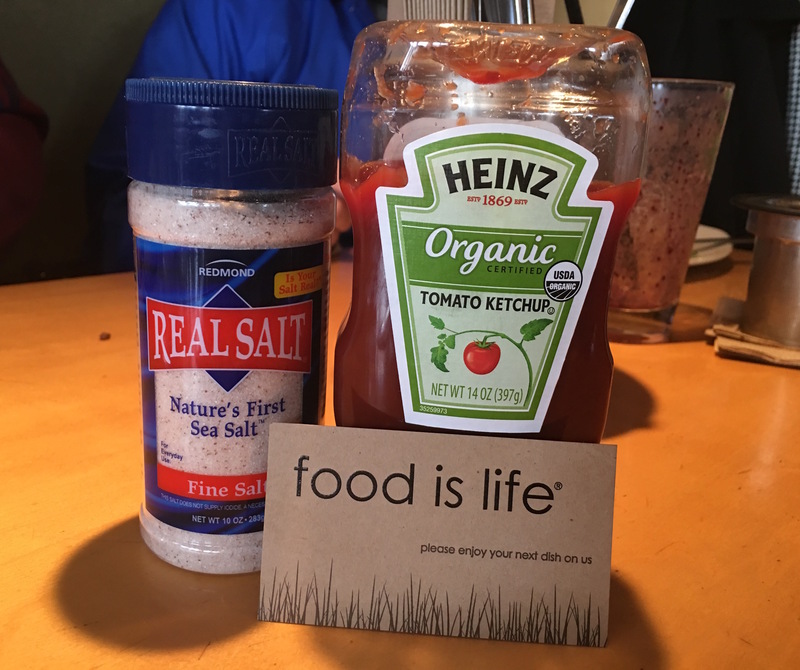 Another shout out is the nitrate free bacon– as a headache sufferer, I try to shy away from nitrates so I appreciate restaurants with this option. I was also impressed with their service; initially, my brother’s hamburger was medium, but he asked for it well-done. We got a free meal without asking for anything! That alone makes me want to return- the customer is valued here for sure! Looking for a good solid burger in Columbus, check out Northstar Cafe. Soon we will have one in Cincinnati as well! GO THERE (Northstar Cafe)! TRY THAT (cheeseburger, veggie burger)! Wow! Sounds delicious! You had me at burger and biscuits and jam!!!!!!! Can’t wait until it comes to cincinnati!!!! You would be drooling over those biscuits. I was surprised how much I liked the veggie burger! What? Who am I? ?